TECHNOLOGY 5 4 | B R O A D B A N D C O M M U N I T I E S | w w w. b r o a d b a n d c o m m u n i t i e s . c o m | J A N U A R Y / F E B R U A R Y 2 0 1 9 Technology Strategies for Municipal Fiber Broadband Building next-generation gigabit architecture and outstanding subscriber experience into today's networks is a sound investment. 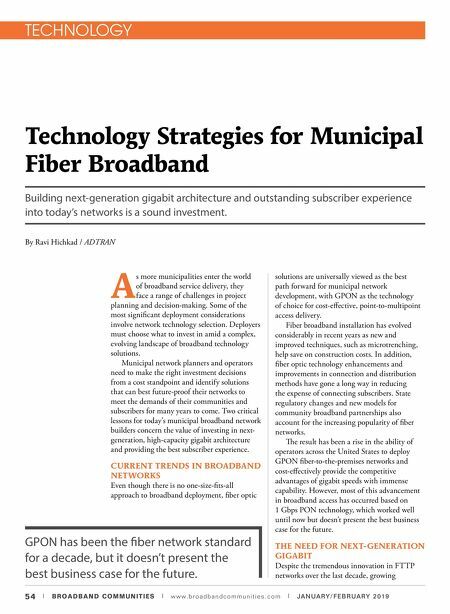 By Ravi Hichkad / ADTRAN A s more municipalities enter the world of broadband service delivery, they face a range of challenges in project planning and decision-making. Some of the most significant deployment considerations involve network technology selection. Deployers must choose what to invest in amid a complex, evolving landscape of broadband technology solutions. Municipal network planners and operators need to make the right investment decisions from a cost standpoint and identify solutions that can best future-proof their networks to meet the demands of their communities and subscribers for many years to come. Two critical lessons for today's municipal broadband network builders concern the value of investing in next- generation, high-capacity gigabit architecture and providing the best subscriber experience. CURRENT TRENDS IN BROADBAND NETWORKS Even though there is no one-size-fits-all approach to broadband deployment, fiber optic solutions are universally viewed as the best path forward for municipal network development, with GPON as the technology of choice for cost-effective, point-to-multipoint access delivery. Fiber broadband installation has evolved considerably in recent years as new and improved techniques, such as microtrenching, help save on construction costs. In addition, fiber optic technology enhancements and improvements in connection and distribution methods have gone a long way in reducing the expense of connecting subscribers. 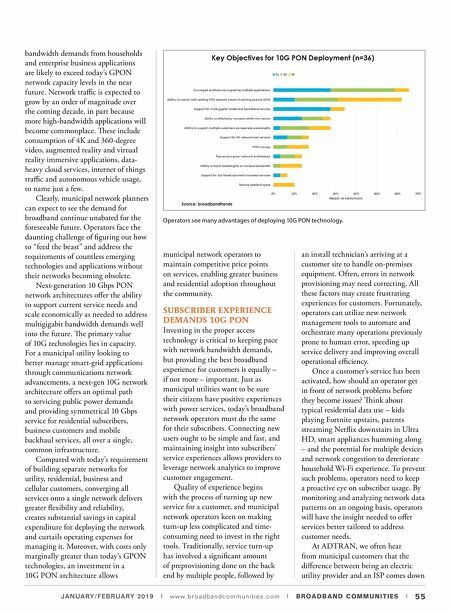 State regulatory changes and new models for community broadband partnerships also account for the increasing popularity of fiber networks. e result has been a rise in the ability of operators across the United States to deploy GPON fiber-to-the-premises networks and cost-effectively provide the competitive advantages of gigabit speeds with immense capability. However, most of this advancement in broadband access has occurred based on 1 Gbps PON technology, which worked well until now but doesn't present the best business case for the future. THE NEED FOR NEXT-GENERATION GIGABIT Despite the tremendous innovation in FTTP networks over the last decade, growing GPON has been the fiber network standard for a decade, but it doesn't present the best business case for the future.